The Next Gen series is for our younger surfers and if you don't see a length or volume combo you like please ask Steve - He can customise a design for you. 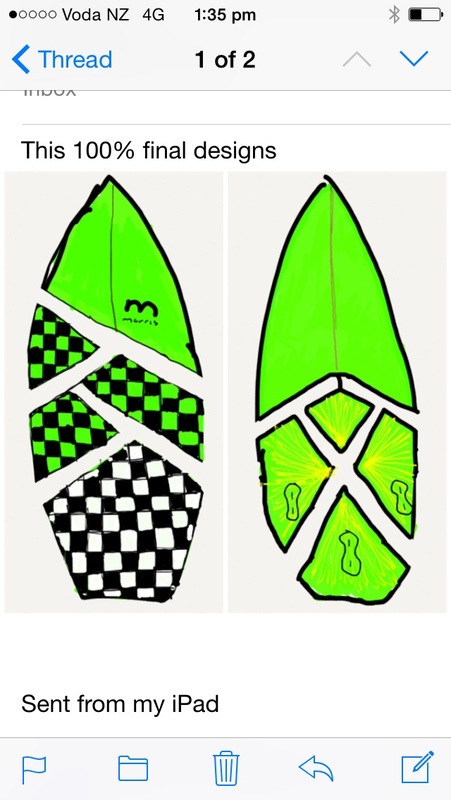 To help out the Grom's we do the Next Gen series for Under 25's at $725.00 including FCSII Glass Flex fins. You must provide proof of age when ordering. Delivery is 2 weeks from confirmation of your order. Designed for the groms as an easy to surf small wave board. Low entry rocker for wave catching and moderate curve through tail. Single to double concave. The template carries width forward and has a hip in the tail to pull the tail in for control. Generally set up with FCSII Thruster plugs using small Performer or Accelerator Grom fins. Designed as a high performance shortboard for fast progressive surfing. Narrower template and more rocker with single to double concave make a responsive little package. Generally set up with FCSII Thruster plugs using small Performer of Accelerator Grom fins. Designed to suit a wide variety of people, Fuller outline and wider nose and tail make it easy to catch waves and ride most conditions. Fuller rails and single to double concave offer a balance between performance and forgiveness. A great second (first fibreglass) board option. Skill level: Begineer to Advanced. I used to ride a board like this and I remember it going so well and having a lot of fun on it so I dug out the old templates and made a 2016 version. The design has a full nose and quite wide through out so it's nice and easy to paddle and catch waves on. It's a nice stable platform and glides over flat sections making your rides longer. The tail is pulled in with two bumps and comes into a 'Bum' tail which is kind of like a swallow tail but without the pointy tips, so it's nice and forgiving. By pulling the outline in the tail using the bumps which act as a break point it makes the turning very quick and it holds in bigger waves to. Can be ordered as a quad also.